The physical store remains central to retailers, even as they implement omni-channel strategies leveraging social, web, and mobile. Innovative retailers, from AT&T to Tesla, are deploying iPads and other tablets in their stores to emulate the ‘Apple Store’ in-store buying experience. By moving the customer interaction out from behind inefficient counters and outdated desktops, the retailer’s workforce can deliver better customer engagement and a more pleasant and ideally, more profitable, shopping experience. The iPad strategy of retailers like these depends on IT’s ability to ensure excellent mobile app performance for the workforce using the iPads to interact with customers. 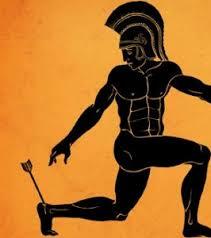 One of my customers recently faced such a challenge and used Aternity to address it. Here’s their story. My customer, a global retailer, deployed iPads to its retail store workforce three years ago as part of an ‘Apple Store’ retail model. The retail staff runs a mobile app on their iPads that provides both point-of-sale (POS) and customer relationship management (CRM) functionality. The workforce uses the app to process transactions, check inventory levels, review customer account information, and receive news from the corporate office. One of the key areas of the POS is a ‘Customer Summary’ page/screen which provides a summary of all of the history associated with a given customer, such as their past purchases, customer service calls, etc. Having the background of each customer at their fingertips enables the retail staff to better serve the customer by anticipating their needs and understanding their purchase and customer support patterns. Leveraging this information enables the business to counteract the possibility of customers leaving for the competition, a key factor, since customer churn is a major factor in the business. Using Aternity, the IT team noticed unexpected low usage of the Customer Summary page. Analyzing the information, they saw that the Customer Summary page was slow to load. The retail staff had the option to ‘opt out’ of the page before it fully loaded, and close it before it fully rendered on their iPad. The reps felt that there wasn’t enough value-add to keep the customer waiting while the page loaded, so they would just continue on with the transaction without all of the customer history. The business, on the other hand, really wanted the reps to use this page as they felt it would provide customers better quality of service and a better experience during the transaction. The retailer’s App Development team got involved and re-did the page so that it would load more quickly. They deployed the updated page to a subset of stores for piloting, and then analyzed the data with Aternity validate that the change actually improved the performance. Here’s a result of that monitoring that shows the page load response time in the top graph, and the volume of transactions in the bottom graph. As you can see, the performance since they’ve introduced the new URL has been 3x faster than the old URL. And this performance improvement was seen across the board in all stores, and regions that the page was deployed to. Having confirmed the positive impact on performance, the company then deployed the new page to all stores. Asretailers adopt mobile as a key enabler of their business strategy, they have recognized the need to monitor mobile apps to ensure customer satisfaction and workforce productivity. 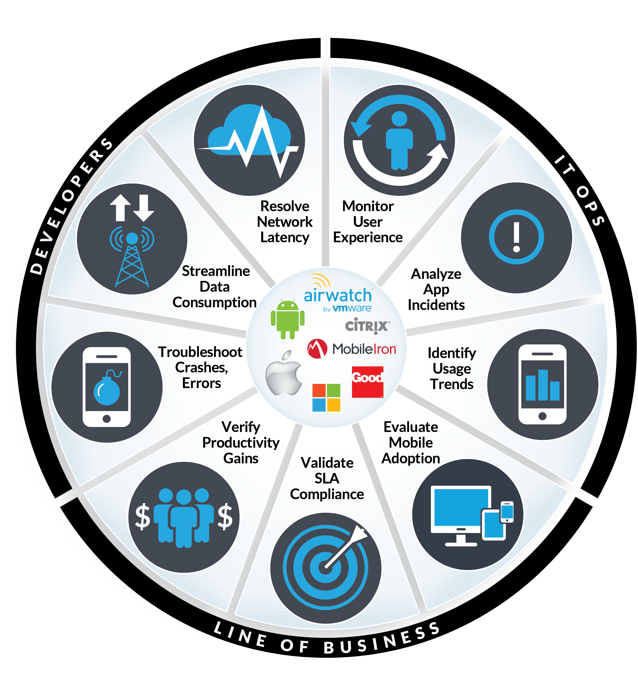 Many Mobile APM products provide mobile app developers with capabilities like crash analytics, app error reporting, service performance metrics, and data consumption tracking. As important as these capabilities are, they primarily solve problems for consumer-facing apps, because they lack visibility into important aspects of the enterprise end user – their identity, role, and business function, the full range of apps and devices they use, and the business activities for which employees are responsible. In this case, the retailer needed to track performance and usage by retail store, location, and market. Workforce mobile apps, such as the POS app described here, require unique capabilities beyond what other Mobile APM products provide to app developers. For IT Ops to prioritize their response to an incident, they need to understand the business impact, the functional organizations and business locations of the impacted users, and whether desktop users are also impacted. For the line of business to determine whether or not mobile is improving workforce productivity, they need metrics and analysis in terms that are relevant to the business, such as the length of time to look up a customer record, or the number of orders processed by retail store. Aternity picks up where other Mobile APM vendors leave off by addressing the full range of use cases for developers of mobile enterprise apps, IT Ops who support them, today. 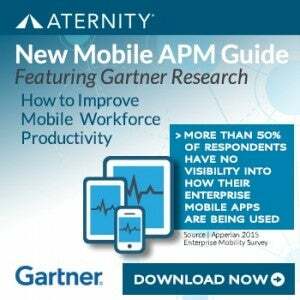 Learn ‘How to Improve Mobile Workforce Productivity’ in this guide featuring Gartner Research!